Your outdoor patio and exterior paths are very similar to the floors in your living room or hallways of your home. The big difference – more attention is given to them since there are no walls and ceilings! Just as natural wood wide plank flooring or a unique natural stone tile can make a dramatic difference in your interiors overall style, the use of natural stone patio pavers and flagging can make a great statement in your outdoor living area. Picking a stone for your outdoor patio can be difficult at first, but we have some information below that can guide you towards the design you are striving for. You can also look through the gallery to get an idea of the type of stone you like. Typically these terms are used when referring to ‘Square and Rectangular’ shaped stone. With most stones that are dimensional, the stone is cut into square and rectangular blocks, then sliced with a saw, like a loaf of bread or even split by hand. Different techniques make for varied surfaces which we will discuss below. Square and rectangular pattern stones typically create a more ‘formal’ look. However, a rustic edge can be achieved by applying special finishes. Irregular Flagstone is as it sounds in irregular in shape. This stone maintains its natural shape as it is ‘peeled’ from the quarry, or found in the woods. The irregular shape of each stone gives a different kind of look once installed. 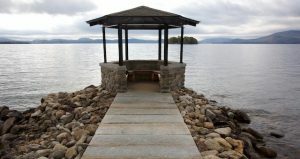 One characteristic to keep in mind is that certain irregular flagstones, such as New England fieldstone, contain a high amount of “cleft” on the surface. In essence, how flat are the stones? As each one is a part of the landscape and formed by Flagstone, is as it sounds in irregular in shape. This stone maintains its natural shape as it is ‘peeled’ from the quarry, or found in the woods. The irregular shape of each stone gives a different kind of look once installed. 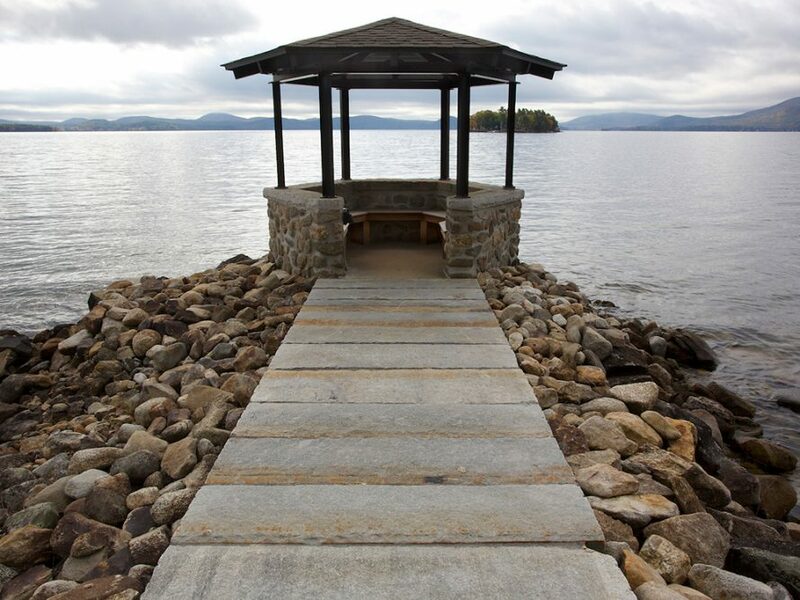 One characteristic to keep in mind is that certain irregular flagstones, such as New England fieldstone, contain a high amount of “cleft” on the surface. In essence, how flat are the stones? As each one is a part of the landscape and formed by mother nature, each one varies by many degrees. Some are simply not suitable for high heels! As most concrete pavers come in smaller ‘brick sizes’ like 2″x 8″, natural stone pavers typically come 12″x 12″ up to 24″x 36″. Usually, the larger the size, the more difficult they are to find. This is especially true when trying to get a uniform color, or a naturally split stone – nature simply doesn’t allow you to determine what you are getting! In addition, the larger the stone, the harder it is to handle both in the quarry, and on the job site. This is why many contractors prefer laying concrete pavers – you can pick them up with one hand! As you can see–comparing this tumbled bluestone patio, with the larger pattern patio, you get a much different look. If you are interested in learning more or a project, please contact Stone Farm.